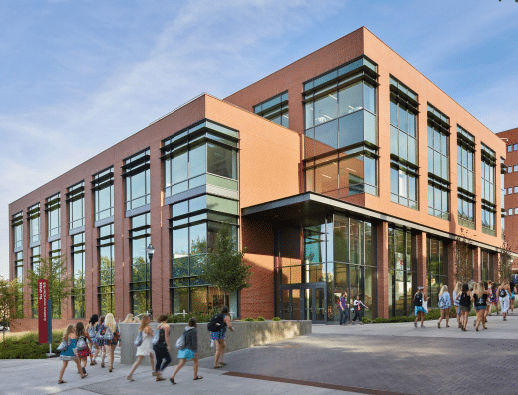 The Spark Academic Innovation Hub, the revolutionary technology-enabled learning and teaching environment at Washington State University (WSU) opened in the Fall of 2017 and is already changing how students learn, collaborate and engage with each other on their Pullman, WA campus. The Spark was designed to be the “classroom for the future” for WSU and to serve as a catalyst for their campus-wide initiative to address innovation in how students are learning today and will be learning well into the 21st Century. In addition, the building was designed to promote excitement in learning and to provide for a variety of models for classroom and informal learning. The architectural firm ZGF was responsible for the overall design of the 83,000 SF high-performance classroom hub. The facility includes a variety of active learning and collaborative classroom types ranging from formal and informal, large group, small group, individual, active, problem-based and makers space, to provide both choice and diversity to the users. The largest classroom is the active learning hall, a circle-in-the-round space that accommodates 360 degrees of projected content. Construction started in early 2016 by Clark Construction and was completed for the beginning of the Fall 2017 academic year. Leveraging our knowledge of technology and the latest in educational trends, Vantage worked closely with WSU’s administration, faculty and students along with ZGF as the lead designer to define the institution’s learning needs, present the latest in educational technologies and approaches, and provide design options for visionary teaching, innovative learning and collaboration spaces. The Spark has multiple learning places that promote active learning depending on the classroom size and expected experience. The 275-seat active learning hall is a rounded open-floor space where lecturers can feel close and connected to participants. The room allows for them to roam freely and collaborate within a 360-degree ring of display screens to further enhance the shared storytelling and discovery experience. By placing the instructor in the middle of the auditorium, surrounded by students in fewer rows, communal learning is strengthened, and it is a huge leap in student learning compared to traditional large-seat lecture halls. Other learning spaces include flexible flat-floor classrooms with intuitive technologies supporting presentation, instruction, collaboration and communication within the classroom and for distance learning. A central lobby common area evokes the excitement of the learning space and can instantly transform and doubles as public presentation and event space. The Spark learning ecosystem tailors itself to everyone’s educational needs with robust data, power, and access to key information such as the building schedule, and room availability. Problem-based learning, open informal learning and other small huddle spaces provide gathering spots for informal learning and collaboration. With the Spark’s hoteling feature, students can reserve a variety of group study rooms using the iPads mounted on the outside of each room. Active learning labs are classrooms that can be configured several different ways, including organizing students into 6-person groups to facilitate hands-on digital learning activities. The Student Skills Studio and Faculty Test Kitchen are design to encourage users to experiment, gain confidence and push academic frontiers with access to new and emerging collaboration and digital media technologies. Some of the technologies available in the Test Kitchen include: virtual reality via HTC Vive and Google Cardboard, augmented reality with mobile devices, telepresence with DoubleRobotics, 3D printing technologies, Digital Sandbox with Xbox Kinect, whiteboard capture and digital annotation, student response tools, and various video and conferencing tools. Where Can I Learn More about the Technology-Enabled Learning Environment at WSU? The Spark is showcased on the WSU website and includes an option for visitors to take a 3D tour of the facility. There’s also a detailed description of each available room and a “teaching in the round” video lecture from one of WSU’s top professors to show others how to leverage the 360 degree active learning experience. ZGF also profiled the project for their website and produced a 32-page digital book of the key spaces and features. You can also visit Vantage’s Technology Consulting for Education on our website or contact us for a detailed discussion of our capabilities in designing technology-enabled learning environments.